Use these plastic 7" Creative Cones in many ways. FLORAL VASE - Cone is open at both ends so for fresh flowers, use a small glass vase bought at a craft store. Cover glass vase with cone. To make it permanent, use hot glue and glue in place. 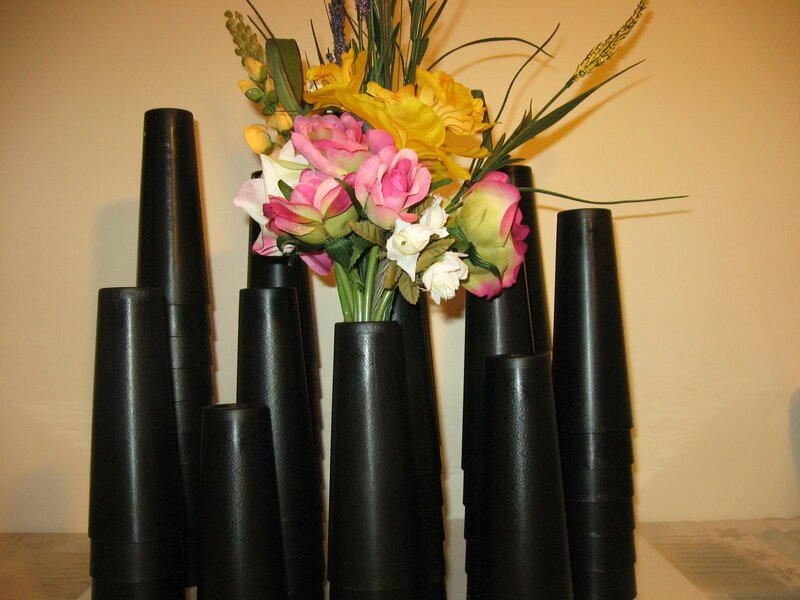 Take your cone with you when you purchase the small vases that go underneath to guarantee fit. Decorate cones by gluing on paper, old Christmas card designs, add ribbons, etc. See some of the pictures throughout the site. Use chalk to draw on outside of cones. Use for kid's play for stacking and building. Take to the beach and make sand castles. Use to blow bubbles. See our Homemade Bubble Recipe for a fun family project. Put holes in the top of the cone with the tip of a hot glue gun and string cones using cord. Cones are 1.5" at top and 2.5" at the bottom. Have textures surface, are washable and the colors are vibrant. See the other Creative Cones Sets sold separately on this website. Will be mailing USPS priority to Continental US. For Canada shipping may vary. We accept Paypal for payment.